Graduate orthodontics student Dr. Kathleen Martin garnered a second place win for her poster in the Charley Schultz Resident Scholar Award program. The program is sponsored by Dentsply GAC and was established by the American Association of Orthodontists (AAO). The competition was held during the 2018 AAO Annual Session held in Washington, DC, on May 5, 2018. Martin presented her poster, “Tracing the Cellular Origins of Mesenchymal Derivatives in Craniofacial Development,” which was entered under the program’s Basic Science Research category. Her research supervisor, Dr. T. Michael Underhill, is a professor in the Department of Cellular & Physiological Sciences at UBC. Numerous genes have been shown to impact craniofacial development. In her study, Martin and co-authors* aimed to understand a particular gene expressed in cells during embryonic craniofacial development by using a new genetic reagent the Underhill Lab developed. This particular gene, named Expressed in mesenchymal cells or Emc, is broadly expressed within embryonic mesenchymal tissues. When the gene is knocked out, many craniofacial abnormalities result, including facial clefting and problems in the development of the skull, palate, eyes and ears. 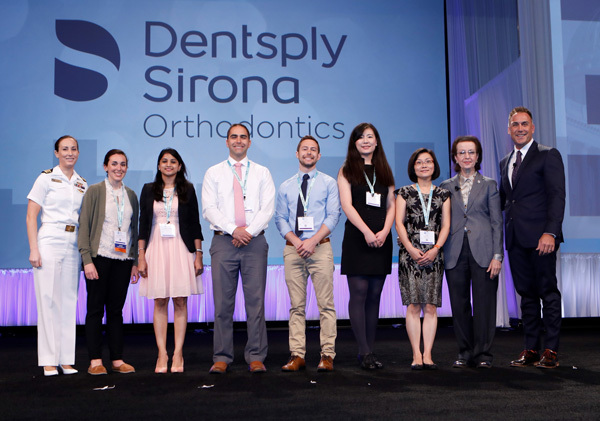 Dr. Kathleen Martin (2nd left) joins other contestants on the stage at the Walter E. Washington Convention Center during the 2018 American Association of Orthodontists Annual Session in Washington, DC, on May 5, 2018. The researchers found that cells with the gene expression (Emc+) and/or their progeny contribute to various mesenchymal tissues during craniofacial development, including facial and masticatory muscles, tendon, tongue, meninges, nasal cartilage and connective tissue, eyes, salivary stroma, teeth, and to populations of cells located around nerves and vessels. While the research improves understanding of the contribution of Emc+ in craniofacial development, Martin and her fellow researchers are hopeful that a multipotent population of Emc+ cells could be applied to the field of regenerative medicine, and contribute to therapies such as tissue regeneration.